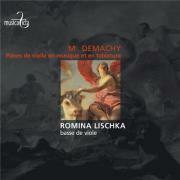 Next to nothing is known about Demachy (or de Machy, or Machy) at this time, not even his baptismal name. We do know that he studied with Nicolas Hotman, who also taught Saint-Colombe. And thanks to the preface to his one surviving publication, eight suites for the bass viol, we further know that he held extremely strong and assertively stated views about his instrument, regarding it as chordal in nature, advocated tablature as opposed to staff notation (though his publication includes four examples of each), and unusually preferred two distinct left hand positions for melody and chords. Saint-Colombe was the most celebrated gambist to disagree with him on this last point, leading Demachy to tell Jean Rousseau, a Saint-Colombe pupil, that he’d chosen a master “who knew nothing about viol-playing” because it was apparent “he didn’t know his left-hand technique.” That would certainly have had repercussions if we but knew them, for among gambists those words are the equivalent of telling someone that their mama dresses them funny. Demachy’s suites may be chordal in nature, but he uses chords to furnish additional voices and rhythmic and harmonic support. Melody drives these works; and if they don’t touch the expressive depths of Marais, another Saint-Colombe student, they still fall gracefully upon the ear. Each of the four suites on the album has seven movements, following a pattern of prelude, allemande, courante, sarabande, gigue, gavotte, and minuet, except for the Suite in G Major that concludes with the lengthiest movement of all, a four-and-a-half-minute Chaconne. As envisioned by Demachy, each dance type has a set of characteristics in common, though dances within a given type may differ only slightly. Thus, the courantes offer training in three beats against two, the sarabandes in phrasing and the proper performance of ornaments, and the gigues in rhythmic precision and agility across the instrument’s expansive range. Romina Lischka has several recordings to her credit, though all prior to this were as part of ensembles, Le Jardin Secret, Scherzi Musicali, and Les Flamboyants among them. She switched from the guitar to the viol at the age of 13, studying in her 20s with Paolo Pandolfo and later with Philippe Pierlot. Here she displays a fine technique, excellent command of tone, and full awareness of style. Her ornaments flow naturally within the line, and her phrasing is fluid. She faces, however, competition from one of her teachers. Paolo Pandolfo has recorded four of the suites (Glossa 920413). Two of these, the Suite No. 1 in D Minor and the Suite No. 4 in G Major, are also present on this disc. Without getting into technicalities, two differences are apparent. First, Pandolfo plays the gigues (and to a lesser extent, the gavottes) at a much faster pace. He sacrifices nothing in the way of tone or accuracy in doing so. He further performs them with a more strongly pronounced accent on the second beat, and in general prefers to clarify the beat more distinctly than Lischka. This gives the faster pieces more lift, and the slower pieces more of a sense of movement towards or away from the cadence. Given a choice between the two, I prefer Pandolfo. However, there is nothing innately wrong with Lischka’s approach, and between the two, the number of Demachy’s suites on record swells with this album from four to six. Viol fanciers will want both.